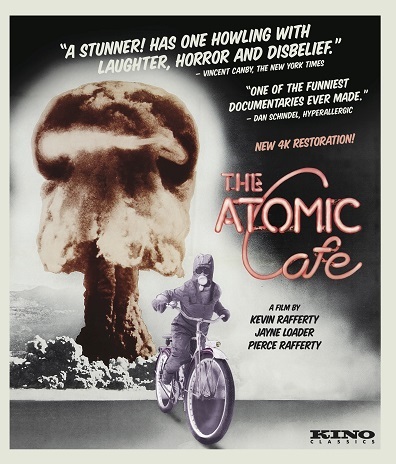 The Atomic Cafe tells the story of the nuclear era with our own propaganda, news and advertising footage, beginning with the first A-bomb tests in the New Mexico desert, to the destruction of Nagasaki and Hiroshima, to the Cold War, Eisenhower and Nixon. It’s a film without a movie camera or microphone, as its creators say, and no talking heads or voiceover narration. Painstakingly stitched together as montage in 1982 before the advent of searchable digital archives or film editing software, the film was restored this year from the original 35mm prints, recapturing visual detail, color and audio clarity lost during previous prints. If we’ve grown accustomed to the existential threat of mutually assured destruction, that global murder-suicide pact of industrial-scale armament, there are relevant parallels to today’s mass shooter drills. First graders are trained in depressingly similar ways to find cover under desks, and to seek safe places in every new room. The difference is, perhaps, the threat of nuclear apocalypse feels remote or more in the realm of science fiction than in American life. The same film would be hard to make with the very real and frequent reality of school massacres. The fact that violence permeates American culture in a nearly casual way will feel as relevant in 2019 as it did in 1982, or 1952, for that matter. Juxtaposing the government’s own messaging with footage it would rather conceal — like that of native people mutilated by nuclear tests in the Atoll islands, or the suffering of children of Japan — allows self-incrimination, always the strongest form of prosecution. The propaganda tells on itself, or inadvertently pleads guilty when shown in the correct order. When a U.S. Army officer tells a group of soldiers planned for radiation exposure during a nuclear training exercise that, “Watched from a distance, this explosion is one of the most beautiful sights ever seen by man,” the methods of misdirection and distraction at the national level are made clear in the individual. Edison harnessed electricity and before long man had the electric chair. Create any technology worth keeping and mankind will find a way to weaponized it. In the case of the atomic bomb, we just skipped directly to the war-making application and explained the rest later. You can find writer Ed McMenamin on Twitter at @edmcmenamin.